Ideal transitional gait training contracture AFO to reverse mild to moderate plantarflexion / inversion / eversion contracture of the ankle / foot (< 30 degrees of plantarflexion; < 10 degrees inversion). The Gait Trainer includes a pull strap that is used to provide a therapeutic stretch of the Achilles tendon / gastroc muscle. A removable ambulating pad allows for weight bearing and initial gait training. 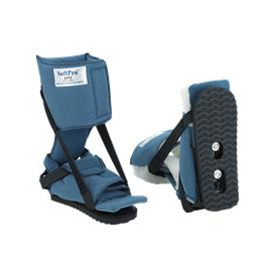 The pull strap can be used to provide a dorsi-assist during initial gait training. Small Fleece SP 30-00 6" - 8" 15"
Medium Fleece SP 30-01 8" - 10" 17"
Large Fleece SP 30-0 10" -11" 19"
Xlarge Fleece SP 30-03 11" - 12" 23"
Small Smooth SP 30-50 6" - 8" 15"
Medium Smooth SP 30-51 8" - 10" 17"
Large Smooth SP 30-52 10" -11" 19"
Xarge Smooth SP 30-53 11" - 12" 23"